I swear by these three wonder items to get me to sleep every night. Because sometimes I need a little extra help. 1. For me an eye mask is essential as it forces me to switch off and catch some zzzz’s. 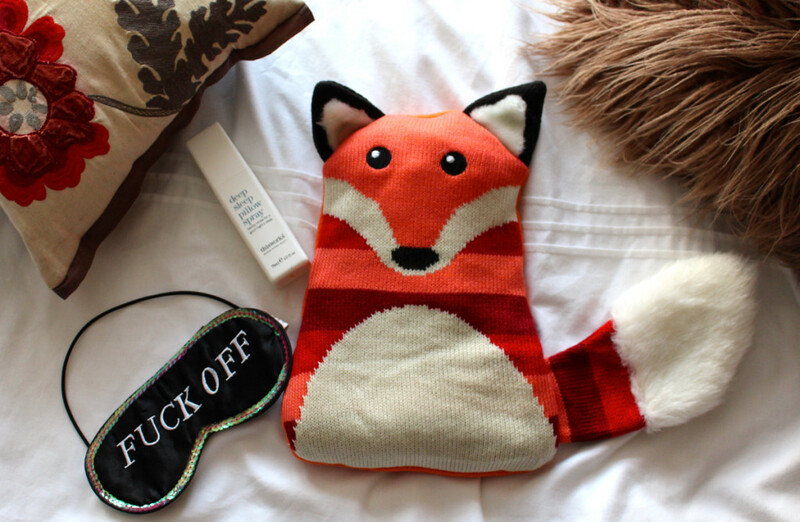 December saw the end of the fox mask *sob*. I’d literally worn it to death, its nose fell off and I had to tie several knots in the elastic just to stop it from wrapping round my neck during the night. Luckily for me my gorgeous cousin wrapped me one up for Christmas. This one has sequins and a charming message across the front which is guaranteed to stop Al from waking me too early at the weekends. 2. A hot water bottle is an essential bed companion for anyone who has IBS. This is one of those ones where you pop the middle in the microwave for a couple of minutes to reach prime temperature. It also smells like lavender which is an added bonus. 3. I know, I know, I always rave about This Works Deep Sleep Pillow Spray but it honestly is that good. Just a couple of pumps and you have a heady mix of lavender, vetiver and wild chamomile filling your nostrils. Calmness just flows through your body. I’m trying to get as many people hooked to this as possible, it’s dreamy. And there you have it, my three night-time essentials that help ease me into the land of nod. Got any tips you swear by? Drop them below.